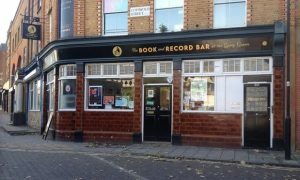 The Book and Record Bar is a fully licensed venue, located right alongside West Norwood train station and on many popular bus routes in the area. We accommodate gatherings from 30 to 80 people and have a licence on Friday and Saturday nights until 1am. We also have a small outdoor area for use included in our venue hire (weather permitting). Alternatively, send an email to: thebookandrecordbar@gmail.com and we shall be in touch soon.